Not to take away from Steve Lein's excellent AFL summaries, but USAFChief and I (plus special guest ashburydavid) were in attendance at Surprise Stadium this afternoon, and we got to see several of our Twins prospects appear in the 6-2 loss to the Glendale Desert Dogs, so I thought I'd write something up, given all this Twins game action. Chief might chime in with his own perspectives, if he ever gets free of rush-hour traffic to his hotel. Basically, nobody really impressed me, I'm sorry to say. On the hitting side, only Lamont Wade appeared, playing the full game in RF. ... struck out (looking) in the fourth, walked in the sixth, and was hit by a pitch in the eighth. Good selectivity, I suppose, but not good enough contact. On defense, he made a couple of routine putouts, and couldn't quite get to a couple of foul balls that a faster player might have reached. Short-sample grade: Incomplete. I want to see more. As for the pitchers, we saw each of the Twins contingent on this team, all in relief. First in was Ryan Eades, who came in with two outs in the third, and then pitched the fourth. 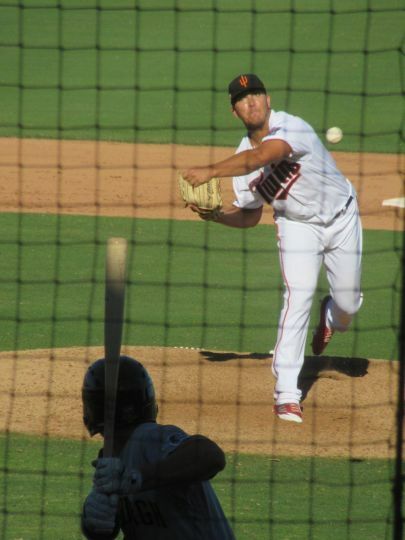 He gave up his first earned run of the AFL season, on a no-doubter home run to left field by leadoff hitter D.J. Peters of the Dodgers, who happened to lead off the fourth. 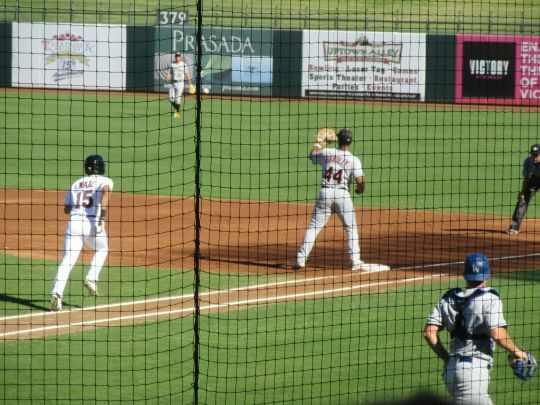 A couple of other hard hit balls also were in play, one a gift double thanks to subpar ball-tracking by left-fielder Luis La O (sic), a Rangers prospect. 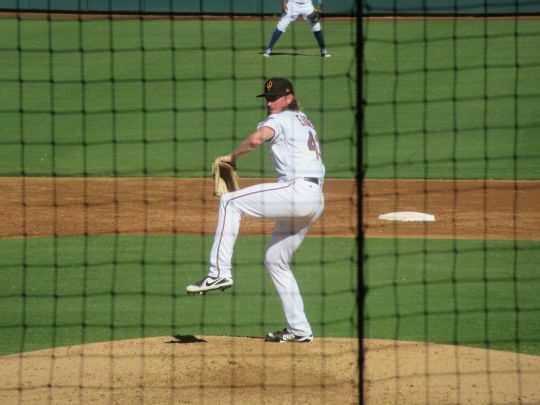 Basically, Eades came across to me as just another pitcher, with a fastball in the low 90s. In the sixth, Tyler Jay came on. 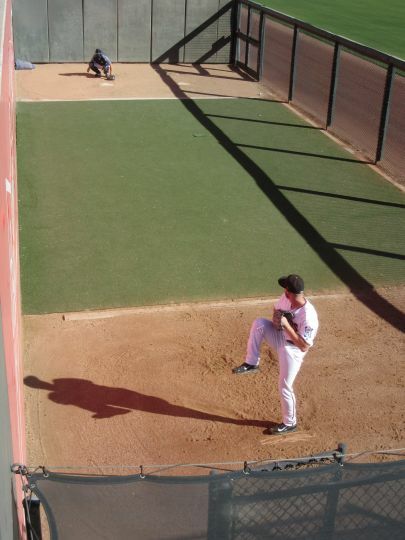 Here he is during bullpen warmups. 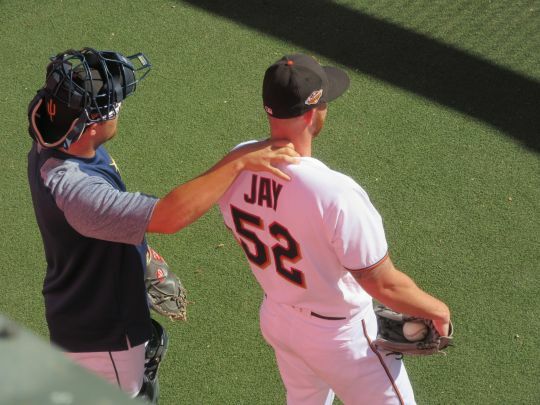 Side note: did you know that one of the jobs of the bullpen catcher is Physical Therapist and Trainer? Seriously, Jay's sidekick in the bullpen was working a kink out of the pitcher's shoulder when I watched him start to warm up. Anyway, as for the game appearance, Jay likewise resided in the low 90s with his fastball; somehow I was hoping for more. He didn't give up any hits and he struck out two, but he also walked two. He seemed aggressive against lefties but tentative versus right-handed batters. Dare I say, he nibbled. 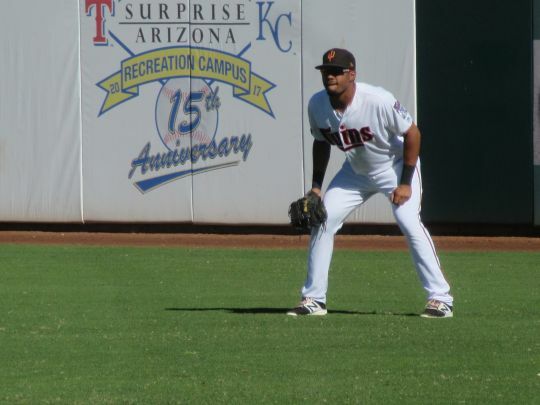 He was followed in the seventh by Thomas Hackimer. (Somehow I wound up with no usable photos of him.) A side-arm righty of not very tall stature, his hit batsman resulted in a warning to both teams. * A wild pitch among the two walks and the HBP meant loaded bases, but he managed to get out of the inning without a run being scored, via a couple of earlier groundouts and a closing strikeout looking. Like Jay before him, Hackimer seemed to me overly cautious when facing batters of the opposite hand. The innings frankly dragged while our guys were messing around on the mound. 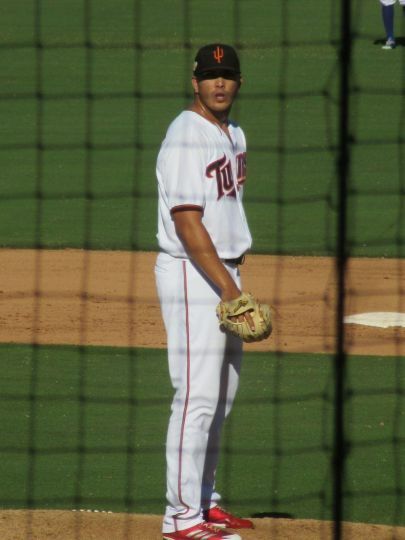 In the eighth inning lanky Andrew Vasquez completed the Twins farmhand effort for the day. In fairness, he was not aided by a grounder that ate up third-baseman Kevin Padlo of Tampa for an error, but he also gave up a clean single to right. He did notch two strikeouts, but like his fellow Twins pitchers did not display a blazing fastball that I crave to see from our prospects. Sad to say, it was probably the best performance among the group, earning maybe a C+. All in all, no one stepped up this afternoon to make a case for being any kind of a darkhorse candidate for an early promotion to the big club as soon as mid-season 2018. IMO of course. * The HBP warning seemed premature to both managers, and seemed to lapse later in the game when Wade was hit in the eighth with no resultant ejections. I really like the plate umpire's name though: J.J. January, a much better "baseball name" than Luis La O. How was the ballpark experience? It's very good at Surprise Stadium. You can walk around the entire park, a feature without which I can hardly give a ballpark full marks. There are nice little features all the way around, such as the bird's eye view over the bullpen, and the grassy area for viewing the game from the outfield. 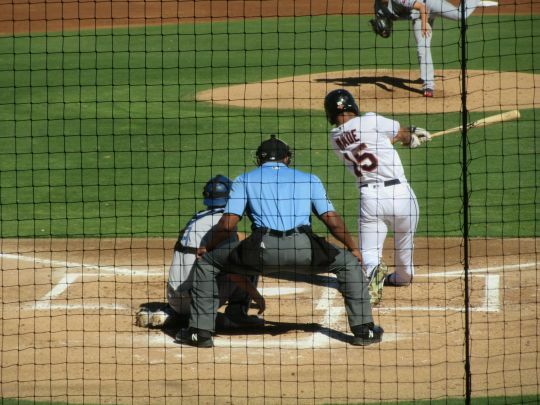 AFL games are typically not well attended, and especially at day games you can get a seat behind home plate (along with many scouts), or whatever other vantage point you prefer - or mix 'n' match seating from one inning to the next if you want. The food was mediocre but that's typical at minor league venues - I drank their $5 PBR not because I'm a hipster but because I'm a cheapster (at least compared to the $8 Bud Lites). The $4.75 bratwurst was a southwesterner's idea of what a brat should taste like, but oh well. I'm gonna to have to get down there one of these years. As someone who doesn't always really love the crowds and rarely sits in his assigned seat, this sounds great. Also, my go-to beverage at Target Field is the 24 oz PBR can. Not my favorite beer, but it's the best bang for your buck at the stadium. You should do yourself a favor and give the Cape Cod League a whirl sometime, too. Thanks for the shout out! I try my best! These notes are awesome. Thank you for sharing them. Did you catch any scout guns on any of these guys, or was it the stadium gun? There's only one or two of the stadiums that track for MLB.com's gameday (Salt River for sure). Jay was 95+ in the Fall stars game on several pitches. Surprise Stadium has a radar readout, Peoria's park (Friday night) does not. I didn't take notes, but I don't remember any of our guys hitting 95 the way other organizations' prospects seemed to. Maybe Jay hit 93 once on Thursday, more like 91 or 92 most of his fastballs. I was hoping for better.